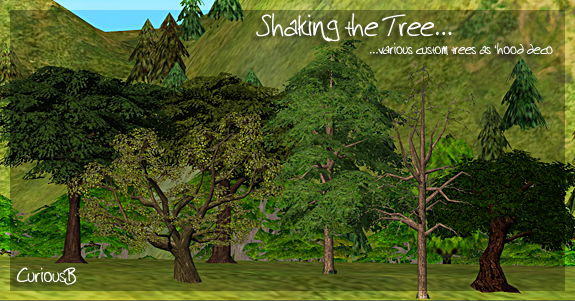 Shaking the Tree: Now With 100% Less Bacon! Another small offering today: a small selection of trees (six in all) turned into neighbourhood deco, as requested at GoS by Casiotone. Not much to say except that they have the same number of polys as the original build mode versions, so I'd suggest that you use them sparingly if you have a lower spec computer/graphics card. Also, there are two versions: one categorized as flora (which, like the Maxis trees, will fade in lot view) and the other categorized as landmarks (which will not disappear in lot view). Take your pick! The files in each set have the same names and GUIDs, so you can't have both at once I'm afraid! Ann(? ), Phoenix Phaerie, Murano and Maxis for the original meshes and textures. ATTENTION NEW DOWNLOADERS - I have now released a NEW VERSION OF THE DERELICT FLATS (all other buildings remain unchanged), which you can find HERE.